With America and others developing “carrier killer” missiles, what does the future hold for surface navies in wartime? America is developing its own carrier killer. Defense Industry Daily reports that the U.S. Navy has budgeted some $198 million through 2017 to fund a sorely needed replacement for its swiftly aging RGM-84 Harpoon antiship cruise missile. The workhorse Harpoon is rapidly being overtaken by rivals such as the Indian Navy's supersonic BrahMos, which outranges the American bird by a wide margin. The Defense Advanced Research Projects Agency started developing a subsonic and a supersonic variant of a long-range antiship cruise missile, or LRASM, in 2009. It subsequently dropped the supersonic LRASM-B while pressing ahead with the subsonic LRASM-A. Testing will commence this year. Assuming all goes well, the navy may soon accept ownership of — and begin funding — the missile's development, manufacture, and deployment in fleet warships. The Defense Industry Daily report speculates that budgetary woes may sink the LRASM program. That would represent a grave mistake, not to mention an awful signal to send to competitors in today's increasingly stressful maritime environment. Not only do U.S. surface combatants increasingly find themselves outranged, but the short tactical radius of contemporary naval aircraft has abbreviated the striking reach of carrier task forces. American forces must venture closer to enemy fleets or shores at the same time defenders are extending the lethal reach of their ASCMs and, in China's case, adding a panoply of other anti-access weaponry to the inventory. The LRASM's approximate 500-mile range is crucial to restore the balance of hitting power. What does the more distant future of surface warfare hold? Suppose antiship missiles come to boast transoceanic ranges — hardly a whimsical prospect if the DF-21D pans out. Sooner or later most of the world's oceans may fall under the shadow of land-based precision weaponry, much as the Allies extended air cover across the Atlantic Ocean during World War II. Bombers flying from shore airfields became potent antiship implements, helping negate the U-boat menace. If missiles fired from land can strike at surface vessels from vast distances, why send out cruisers or destroyers — basically mobile launch platforms — to accomplish the same thing at mortal risk to themselves? Such developments could see the offense-defense balance shift radically toward the defense, obviating the advantages cruise missiles and high-tech combat systems like Aegis bestowed on seaborne forces starting in the 1980s. If so, extended-range fire support coupled with submarine warfare could convert the seas into no-man's lands in wartime. I doubt new technology will empower defenders to command the sea from the shore, but it might well empower them to deny command across broad expanses — making for a Mad Max future on the high seas, a war of all against all. 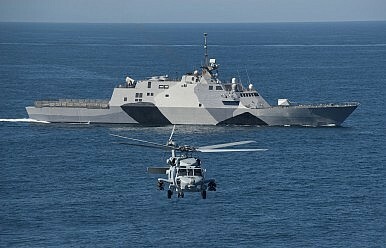 Is the end of surface combat fleets coming into sight? It's not an immediate prospect. Strategic one-upsmanship typifies international competition and conflict. Innovation begets counter-innovation. Nevertheless, the maritime strategic landscape is starting to look grim for "skimmers" such as myself who ply the water's surface. Surface navies doubtless have a future in peacetime. Whether they can contribute in wartime, even if armed with carrier killers, is worth pondering. Much has been made of the missile dubbed “the carrier killer.” Can it be countered?